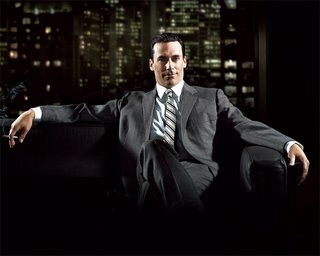 (Left) Gabriel Macht as Lawyer, Harvey Specter on USA's "Suits"
(Right) Jon Hamm as Creative Director, Don Draper on AMC's "MadMen"
While you all know my obsession with the television show "Mad Men" on AMC, my latest and greatest addiction is the new show "Suits," Thursday nights on USA. 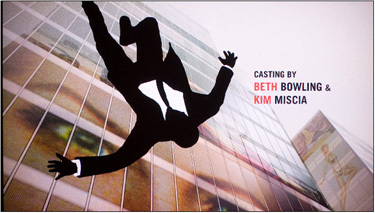 It's no replacement for Mad Men, which delayed it's fifth season until 2012, (how dare they make me wait!) 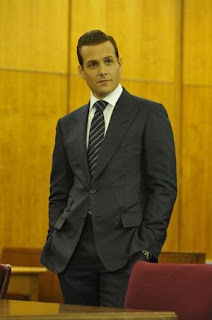 however, "Suits" has stolen a place in my heart, (or shall I say..it's main character, Harvey Specter has stolen a place in my heart...) and proven to be not only a stylish show, but a well written one, full of wit, risk, surprise, and a serpentine of character dynamics! These two shows and two leading men, have more than just their good looks in common, despite being set in two entirely different decades. 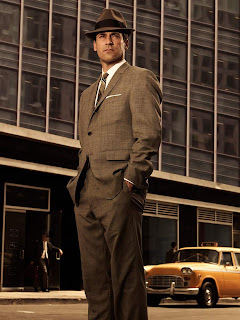 "Suits" is set in contemporary 2011, while "MadMen" takes place in the 1960's. 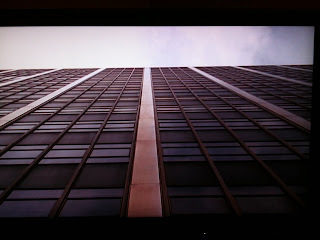 The fifty year difference is clearly evident in the issues encountered on both shows, ex: "MadMen" featured an episode on President Kennedy's assassination while "Suits" dealt with computer hacking. 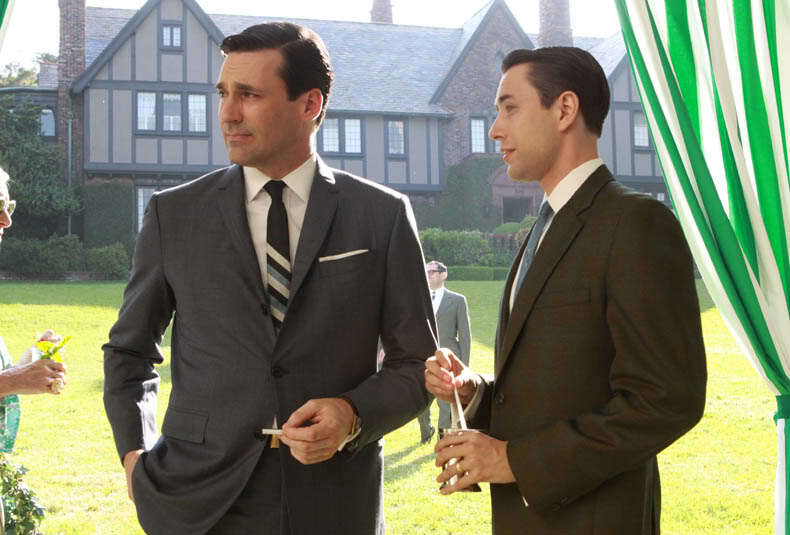 While the shows differ in their period references, the leading men are cut from the same cloth, sharing classic male qualities that causes men and women alike to want to BE them, sleep with them, or at least keep watching them! WHAT THESE MEN HAVE IN COMMON AND WHY WE LOVE THEM.. They both work in Manhattan office buildings!! New York sky scrapers can not only be considered the center of business, but a place for a man to fall up or down. 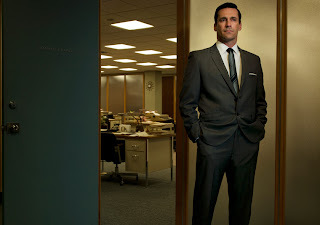 He can either climb up the "ladder" to success or as the animated Don Draper does in the credits of "MadMen," fall from his self made pedestal. Don and Harvey both have amazing offices with views. Their power is represented by being "above the city" as one man in isolation, artfully separated from the maze of cubicles. They Love The latest cars. 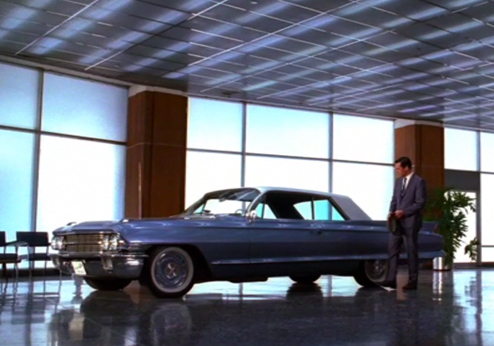 Don goes shopping for a new Cadillac when he is rewarded at work. Harvey takes joyrides in the latest car of his choice with a stunning woman. The instant gratification plays to the men's financial status, flaunting what they have achieved and owning it behind the wheel. Hot, yet seemingly heartless, of course, as the stereotype goes, these men have "commitment issues"and apparently, the same taste in women! Abigail Spencer seduces both Harvey and Don! 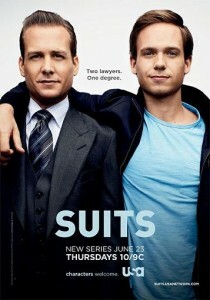 In "Suits" she plays Scottie, a rival lawyer from Harvey's past that attempts to one-up him on a deal. 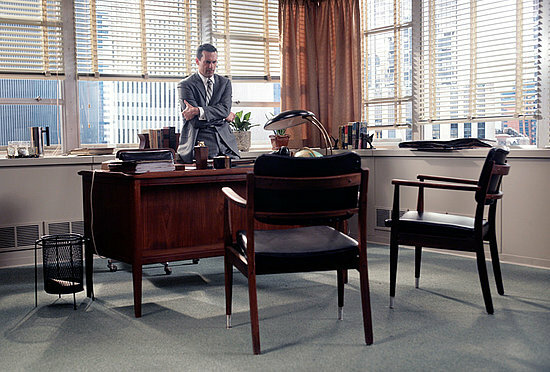 In "MadMen," Spencer plays Miss Farrell, an elementary school teacher that teaches Don's daughter, Sally. Abigail Spencer on "Suits" an intellectual equal to Harvey and not afraid to "play the man"
Harvey plays the classic bachelor/player and unlike Don, was not married. 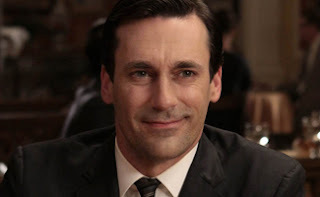 Abigail Spencer on "MadMen" playing a youthful and natural Miss Farrell who deludes herself about their relationship while Don is married to Betty. However, in season 4 Don announces his engagement to his secretary, Megan. WHAT INTRIGUES US: SO CALLED "COMMITMENT ISSUES" REALLY MAKE US WONDER WHICH WOMAN IS GOING TO "BREAK THE SPELL?" ONE WOMAN WILL ULTIMATELY BE MORE SPECIAL TO HIM AND WE WANT TO SEE WHO THAT IS AND HOW HE CHANGES. Harvey and Don always have the answer, even if it is not revealed immediately. The two men stay collected and work "off the cuff" with confidence. 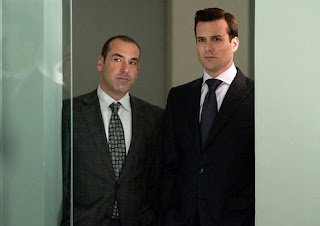 Harvey and Don have to get along with coworkers that want to "top" them and simultaneously turn out to be annoying, but necessary characters. 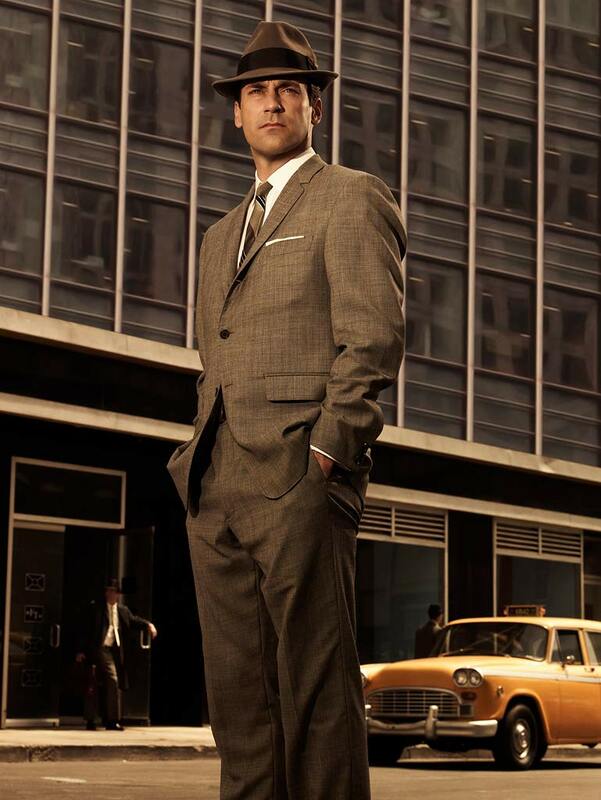 The key to an attractive man is his tailor. 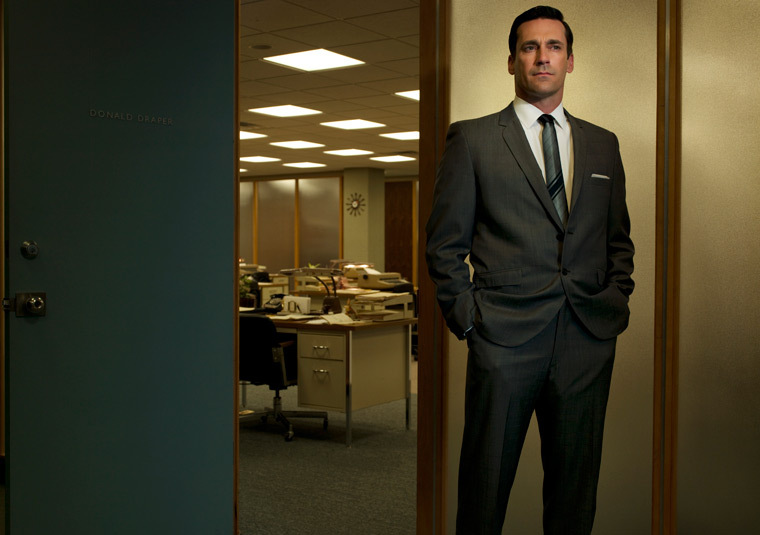 With sharp and well fitting suits, the man becomes the man he wants to be. I love that harvey also wears three piece suits to work! At then end of the day, he is simply a man...with a vice.